At the start of this year … my wife and I set a goal to pay $0 in federal taxes in 2018. Up until a year ago, I didn’t even know this was possible … especially when my wife and I have around $100,000 of annual W-2 wages. But when I read how another blogger made a 6-figure income and paid no federal tax … I realized it could be done. As I started investigating our tax situation, I quickly realized that we could optimize our income so that our final federal tax bill would be $0 too. So starting in 2018, we will end up keeping over $3,000 of income we would have paid the federal government. And even though we can’t completely eliminate all of our taxes (payroll and state) … I will still take that $3K worth of tax savings. In order to keep our federal tax liability to $0 … we needed to take several steps. Most of this included using tax deferred accounts like a 457b plan to keep our tax liability to a minimum. We put together a retirement investing strategy for 2018 on how we would save and then invest our money … all while optimizing our tax liability. At the beginning of the year, we projected our annual contribution to my pension at $6,000. But when this projection was made, we loosely based it on contributing 6% of $100,000 … which isn’t accurate. My W-2 income is a bit higher than that … plus I recently got a cost of living increase. Based on better data, we have bumped our estimate up to $6,150 … which will automatically go right to my pension each paycheck. This is a mandatory contribution … so unless my income goes up (or down) … this should be the amount we contribute. On top of that 6% personal contribution, my employer throws in a little over 8% match to the pension … which could add a nice source of income when I leave my job. Speaking of leaving my job … I am eligible for a partial pension paycheck in just over 12 years. Or I could get my full pension if I waited 17 more years. Our long term financial independence goals don’t really factor in my pension … so this will be “icing on the cake” for retirement income. There are a lot of unknowns about pensions … so I don’t want to be dependent on it in case something goes wrong. For the first 9 months of the year, I contributed a total of $4,597.24 to my pension. With 3 more months to go, our total pension contribution will be a bit higher. In order to pay $0 in federal taxes in 2018 … we need to leverage one of my work place pre-tax retirement accounts. 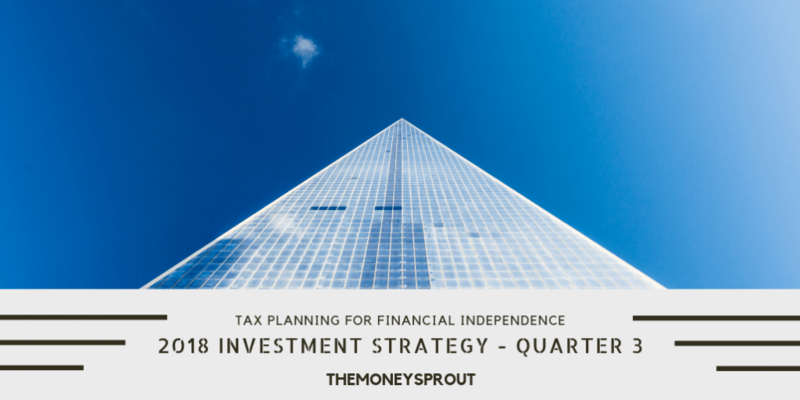 Late last year I opened a 457b plan through my employer. This move will help us optimize our income and pay no federal taxes this year (2018). We have estimated that we need to invest a minimum of $8,000 in this account in order to fully optimize our taxes. Since this retirement bucket is crucial in our tax optimization strategy … it sits 2nd on our priority list. The maximum contribution limit for 2018 for the 457b plan is $18,500 … which gives us plenty of room to maneuver with our tax optimization. We could make a choice and max out this bucket … but we don’t need to at this point. Instead, we want to leverage our Roth accounts for future tax optimization too. So for now, we plan to contribute $12,905 to this account in 2018. This is up from $12,225 in our last quarterly update. For the first 9 months of the year, we have contributed a total of $9,215 to our 457 account and plan to add another $3,000+ over the next 3 months. The spousal Roth IRA is third on our retirement bucket priority list after my pension and 457b contributions. For 2018, the maximum contribution limit for any IRA is $5,500. During the first 9 months of the year, we have invested $1,000 into my wife’s Roth IRA. As I mentioned before, one of our goals for the year (2018) is to pay $0 in federal taxes. In order to do that, we have optimized our income and tax liability by contributing over $8,000 to our 457b plan. By doing so, we likely won’t need additional IRA deductions to optimize our taxes any further. This means we don’t necessarily need additional deductions and can take advantage of putting our money into Roth accounts. That will help us start optimizing future taxes. We haven’t focused too much on this account in 2018, however we still hope to max it out. That means we need to add an additional $4,500 during the remainder of the year. This is another Roth account (in my name) that also has a 2018 contribution limit of $5,500. We won’t have enough available funds to hit that target this year, but hope to contribute a total of $2,000 to this Roth account in 2018. Maximizing my wife’s account is first priority and then this account. Hopefully next year (2019) we can focus on building both our Roth IRA accounts for future tax optimization. For the first 9 months of the year, we have invested $1,930 into this account. Note – My previous estimate last quarter was $2,800 in contributions. We have lowered this to $2,000 in order to focus more on building my wife’s account..
Our goal for this year is to now invest $8,000 of our income into these accounts. At the beginning of the year, our goal was to invest $10,000 … but we are focusing now on our Roth accounts first. A good portion of these investments in 2018 were from last years federal tax return. Because of our new tax optimization strategy … we can’t expect such a big tax return in 2019. In total, for the first 9 months of the year, we have invested $5,934.44 in these accounts. I would like to point out that the dividend income we are earning is calculated into our tax optimization strategy. We expect to earn around $3,300 in dividend income this year from our taxable accounts. This is included in our overall income earned for our taxes. The good news is most of the income we are earning are from qualified dividends … and thus not taxed. The remaining portion is not currently enough to push our income levels to a point where it would be taxed. The combined contribution limit for an individual is $5,500 for 2018. That means I can contribute up to a total of that amount for the sum of my Roth IRA and traditional rollover IRA. Since our approach in 2018 is to maximize our Roth accounts because of current tax law, this traditional IRA bucket falls to the bottom of our priority list. At the beginning of the year, I actually contributed $100 to this account … which is why it is even included in the list at this point. If our income levels ever rose high enough to max out all our other retirement accounts, then we would consider using this bucket to invest. For the first 9 months of 2018, we invested $22,776.68 (up from $16,266.61 in the 2nd quarter). That is approximately 22.2% of my entire 2018 expected income … which puts us on track to save over 25% of our income. Of our total savings, $13,912.24 went to tax deferred accounts including my pension, 457b plan, and my $100 IRA contribution. The combination of these investments will help to lower our taxable income for 2018. This is a key step that has been carefully planned out so we don’t pay any federal taxes this year. Another $5,934.44 was invested in taxable brokerage accounts. Any capital gains or dividend income earned from these investments “could” be taxed. Since we are long term buy and hold investors, I am not so much worried about capital gains. Dividend income could be taxed but as I mentioned before … it isn’t that much of an impact at this point with qualified dividends. The final $2,930 of investments were made to Roth accounts. These investments won’t help to lower our taxable income this year … but there will be tax advantages when we take the money out. So as long as we our optimizing and keeping our taxable income below a certain threshold … we want to take advantage of these Roth investments while we can. 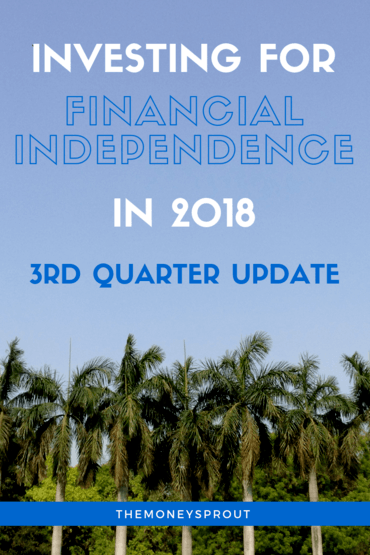 Overall … we have lowered our projected 2018 investments to $34,655 after the end of the 3rd quarter. If we hit this target, then we will have invested almost 34% of our income this year. Based on the next 3 months, I don’t see us hitting this goal and feel we will end up around 30% savings rate. One day we would like to push this up to 50%, but we got a ton of work to do in order to hit that goal. How are your 2018 investments going? Are you on target still? What types of accounts are you investing in?